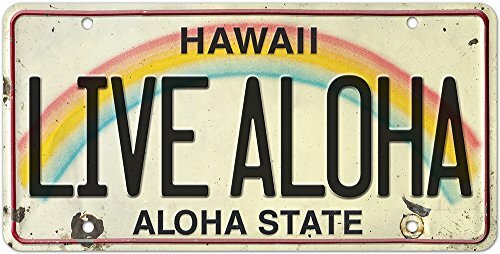 Enjoy a taste of Aloha with these vintage-style License Plates. They are made of embossed aluminum and measure 6in x 12in. Packaged in a resealable polybag they are the ideal gift for any occasion and they will perfectly accent any kitchen, home, bar, pub, game room, office or garage. 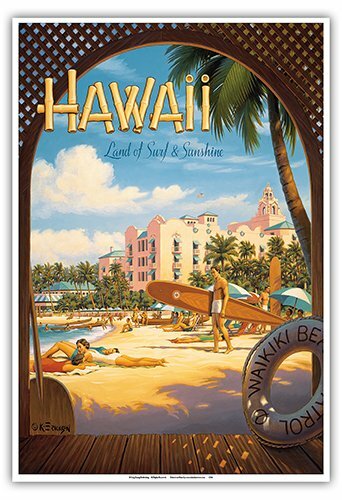 Enjoy a taste of Aloha with these vintage-style Metal Signs. They will perfectly accent any kitchen, home, bar, pub, game room, office or garage. 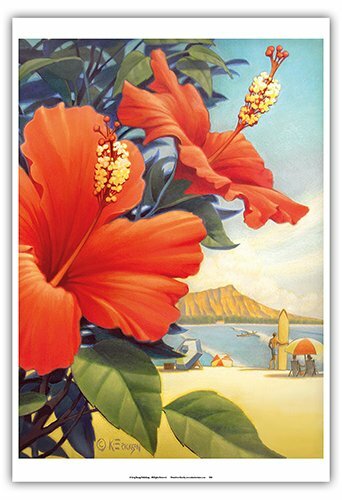 This scene depicts a beautiful Hawaiian hibiscus flower set against Waikiki Beach. For over 30 years, award-winning artist Kerne Erickson's retro-style travel posters have been taking viewers 'on location' to popular destinations around the globe. Inspired by vintage vacation photos, brochures and other graphics, his depictions are painstakingly researched and meticulously depicted for historical accuracy as well as irresistible nostalgia. At a time when sterile, computer-generated art has become popular, it's refreshing to see an artist like Kerne who can work his way from a well composed pencil drawing, through transparent layers of under painting, building depth and tonality until finally adding the finishing touches that bring the work into focus. His work is a perfect blend of traditional technique and modern painting mediums. Erickson, a graduate of Los Angeles Art Center College, worked for years as a freelance graphic artist on client commissions which served to develop his distinctive style. He is now a freelance artist working at his home in Orange County, California where he lives with his family. 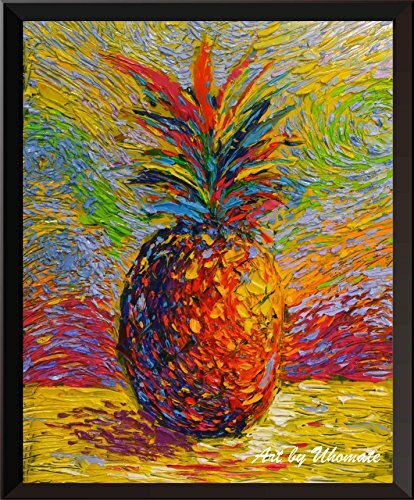 Enjoy a taste of Aloha with these beautiful Hawaiian Fine Art Prints by Pacifica Island Art. 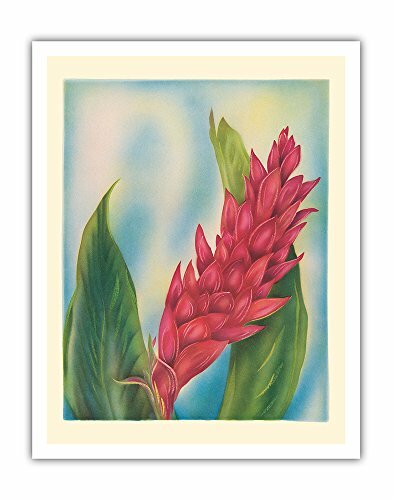 This print will look wonderful framed in the home, office or restaurant and is perfect for the Hawaiian art collector. TIP FREEMAN (1908-1995) was a film and theater stage designer who was also among the nation's top airbrush artists. Graduating from the Chicago Art Institute, Freeman traveled internationally throughout the 1930s, working on the movie production of "40,000 Horsemen" in Australia, for which he created the scenery and sets and played the part of an Arab sheik. 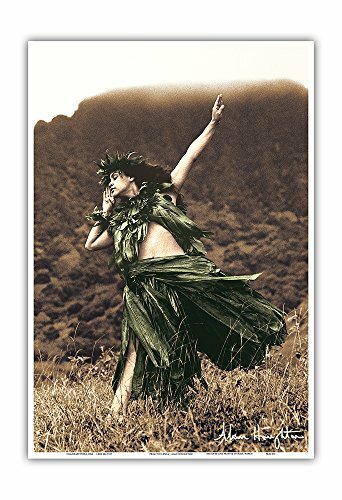 In late 1939, he opened the Tip Freeman Art Studio in Honolulu, Hawaii, painting murals and stage drops as well as exploring his pioneering airbrush techniques, During World War II he sold his airbrush paintings by the hundreds to servicemen through military commissaries and was named one of the ten leading airbrush artists in the country. 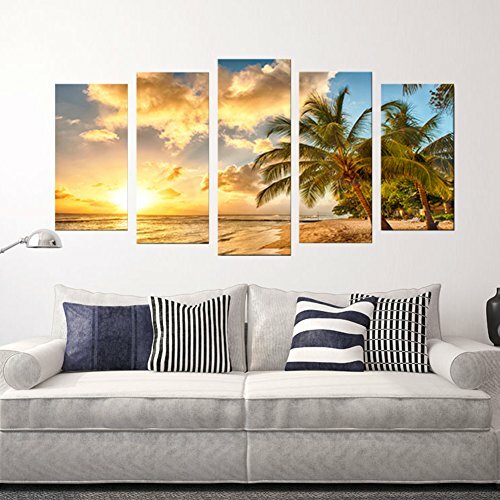 Looking for more Hawaiian Painting similar ideas? Try to explore these searches: Clothworks Fabrics, Ladies Figure Skate Boot, and Shaker 30' Sink Cabinet. Look at latest related video about Hawaiian Painting. Shopwizion.com is the smartest way for online shopping: compare prices of leading online shops for best deals around the web. 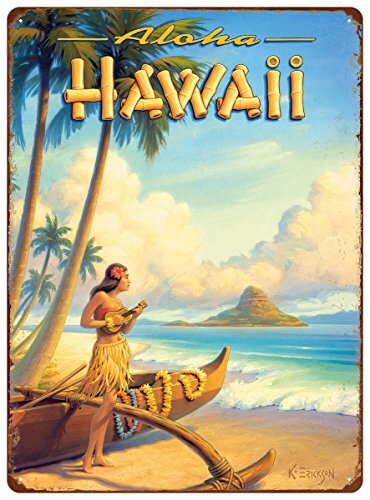 Don't miss TOP Hawaiian Painting deals, updated daily.